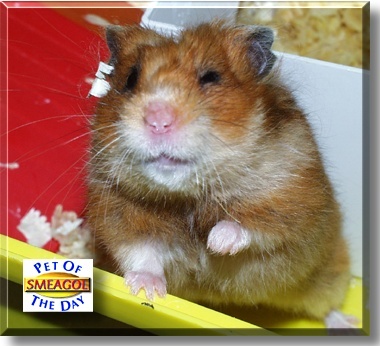 My hamster is named Smeagol which is a strange name from the book 'Hobbit'. She is a Teddy bear hamster, and is one and a half years old. She is so special to me, because she is the nicest hamster I've ever seen. She is so gentle, that even when you are feeding her from your fingers, she carefully gets the piece of food, making sure she doesn't bite. She performs little tricks from her cage, like hanging upside-down from the ceiling, and doing somersaults from the roof of her house! She is looked after well, and fills her cheeks so full, so she can keep a little pile next to her house. She even cleans up after herself, making a pile of her droppings so it's easy when it comes to cleaning her cage! She lives in Devon, England. I love her very much.